Relapse of eye cancer can be devastating, especially after months or years of stable EUAs and other tests. The realization that you are on the rollercoaster again is often gut-wrenching, sometimes worse than initial diagnosis. Everything you experienced at diagnosis may come sweeping over you again. Shock, disbelief, denial, confusion, panic, guilt, anger, fear. Parents often feel the stuffing is knocked out of them more than at diagnosis. You may experience overwhelming fatigue, dizziness, headache, nausea or difficulty breathing. However, these raw emotions will be tempered by the knowledge you have gained since diagnosis. You know the hospital routine, understand the tests and treatments, and have established relationships with the medical staff. You have probably learned the names of respected doctors to contact for second opinions. Most importantly, you have seen other families go through relapse and emerge on the other side with a happy, healthy child. Many of these symptoms are also signs of normal childhood illness, but unexplained symptoms that last for more than two weeks should be investigated promptly by the ophthalmologist or oncologist who treated your child. A primary doctor may not realise their significance. 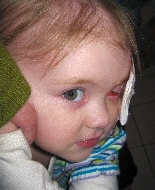 Relapse is common among children who have eye salvage treatment. New tumours may form and old tumours may re-grow with exhausting frequency. Children often experience multiple relapses or new tumours over several years. If your child’s treatment was part of a clinical trial, a relapse treatment plan may be included in the clinical trial protocol. Tumours may be controlled with laser or cryotherapy and more frequent EUAs. Plaque, radiotherapy or chemotherapy may be proposed. Depending on your child’s previous treatments and the nature of the relapse, the options may be very limited. You may find a second opinion valuable at this time. Fear of what lies ahead can be intense. Some families feel cheated and angry. Have I put my child through this nightmare for nothing? Will the eye be lost despite everything we have thrown at this cancer? When will it end? Other families slowly find peace over time, knowing they did everything in their power to save their child’s eye/s. Eventual loss of the eye is often an unexpected relief – finally the monster is slain. When a child receives appropriate eye-salvage treatment, close follow up of both eyes and prompt, appropriate treatment of new tumour activity, cancer rarely relapses outside the eye. When an eye is removed and pathological examination finds there is a high risk of relapse, children usually receive preventive chemotherapy. Few children relapse after this treatment. However, when retinoblastoma relapses outside the eye, very intensive therapy is needed and the chances of cure decrease. This is an unspoken fear for many families. Before proceeding with treatment, you and your child’s doctors need to discuss the goals of therapy. Are you aiming for cure, or for your child’s comfort and a high a quality of life? Aggressive treatment with poor chance of cure may rob you of precious time together while your child is still well enough to enjoy life. Ask the doctors to be honest about chances of cure, so you can make the best decisions for your child. These conversations will force you to confront the agonising possibility that your beautiful child may be dying, but they will also help you ensure that the treatment plan is appropriate for the complete wellbeing of your child and entire family. Information about end of life care.